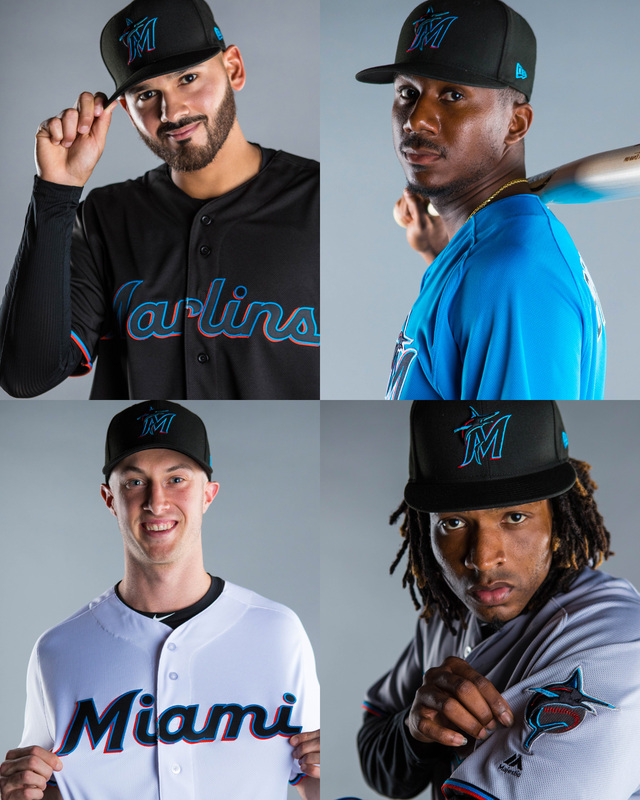 The next-generation Marlins identity is stylish, energetic, and vibrant in ways that uniquely represent the Miami community. This next evolution of the team's logo embodies refinement and style, with a focus on looking forward -- towards the future. 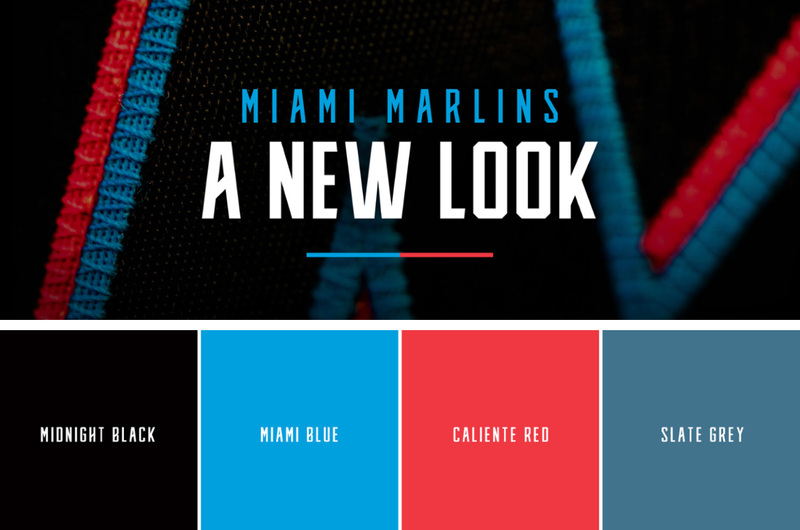 Miami's new colors are: Caliente Red, Miami Blue, Midnight Black, and Slate Grey. Our Colores can be seen throughout the culture of Miami, on the vibrant streets and metropolitan landscape of South Florida, and are representative of the shades of colors found in the large variety of cultural flags flown throughout the community's many neighborhoods. The logo and colors aim to capture the rich baseball history, diversity, and energy of the area. The pairing of Miami Blue and Caliente Red pop off of the base color of Midnight Black, energizing the script and giving the logo an electric and vibrant look -- emblematic of the Miami energy and nightlife. The styling of the modern script "M" and curved tapered serif font is a classic approach influenced by the typography commonly found among the Latin-American culture. The look has as much to do with the infusion of the local Hispanic culture as it does with the history of baseball in Miami as the font style and accent colors are a throwback to the Miami Marlins and the Havana Sugar Kings of the 1950s. New look, colors and type. Logo and “Our Colores” theme introduction. I never liked the old logo — I don’t dislike it as much as I disliked it in 2011 (geez, 2011-Armin, take a chill pill!) — so I’m glad they have updated it. The new logo is much better; it has energy, it conveys the night life of the city, and it has much more “flavor” than before. The marlin drawing is mostly decent when it comes to the edges and how they resolved the swooshy elements but it seems they couldn’t figure out how to resolve the fins and they become distracting elements in what’s otherwise a logo that revolves around strokes and outlines. The baseball in the negative space is pretty clever and I like how it accentuates the motion of the marlin while providing some depth to the overall design. The typography is decent too and it’s refreshing that it is not a spiky thing. As decent as the new logo is, I wish it had captured the spirit of the video and the raw illustrations in a much more authentic way. There is a rawness in those two elements that gets lost in the much more polished logo. But I understand this has to still operate within the MLB world and it definitely has a little more personality than many MLB logos. Lastly, and hopefully this doesn’t devolve in the comments, it’s interesting to note the increasing use of Spanish in sports marketing language… it started subtle with team color names in Spanish but, here, the main marketing message is not just in Spanish but Spanglish and it makes sense for this to happen in Miami or Austin instead of, say, Milwaukee, but something that should be interesting to see how it develops in the coming years. Thanks to Nick A for the tip.